A German cake favorite: plum streusel cake or Zwetschgenkuchen, a standard recipe in any German kitchen or bakery. This easy plum cake is one of my favorite German autumn cakes, one of just anybody’s favorite autumn cakes in Germany, I suppose. 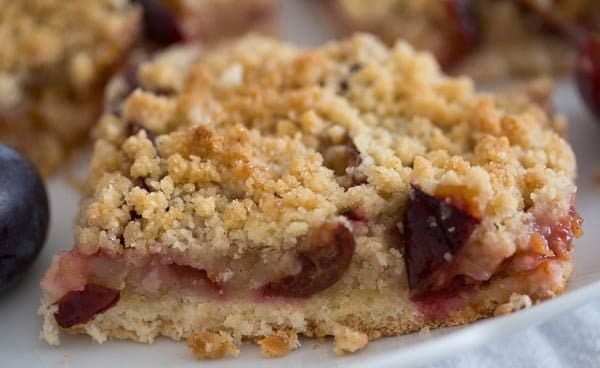 Nothing speaks more of autumn, crisp air, warm kitchens and delicious cakes than this amazing German plum cake, a typical German streusel cake or Streuselkuchen with plums. Any German person who bakes has probably baked this easy plum cake before, anyone who doesn’t bake probably buys it at the bakery every autumn. It is the quintessence of an autumn cake in Germany: the yeasty dough, the sweet and sour plums and the crispy, sweet streusel topping. I love it so! I have been baking this German plum cake for ages, I had it for the first time almost 15 years ago, baked by my mother-in-law and have been baking it myself every autumn for the past 10 years. It is so good, it just cannot be missed. I have also eaten many bakery versions of the German plum cake during the last years and although bakery cakes in Germany are always very good, the homemade version of this plum streusel cake is still better. You can then have it fresh from the oven, still a bit warm, fluffy underneath, moist and rather sour in the middle, crisp and sweet on top. It can hardly get any better! I have been working with yeast a lot during the last 10 years. I know that many people are intimidated by yeast and prefer not to even try baking a yeast cake, but you really should get over it. 🙂 Yeast is nice, yeast is easy and the few minutes kneading can be managed by anyone. If you have a food processor that kneads, even better, the machine can do the kneading for you as well as the streusel, so making this German plum cake could not be any easier. I usually use fresh yeast to make any kind of yeast dough, fresh yeast is just better than active dry yeast. However, I know that fresh yeast is not available everywhere, so since I have started blogging I keep making many yeast cakes and breads using active dry yeast. It works. I feel that cakes and breads made with fresh yeast are somehow higher and fluffier, but active dry yeast is a very reasonable substitute. One major difference that I have to mention is that dough made with dry yeast needs a longer rising time than dough made with fresh yeast. When making this plum streusel cake with fresh yeast, the dough needs about 30-40 time (depending on how warm my kitchen is), while dough made with active dry yeast needs about an hour, sometimes an hour and 10 minutes. Keep an eye on the dough and continue with the recipe as soon as the dough has doubled in size. If you leave the dough for too little time and it doesn’t have enough time to rise, the end product will be rather flat and not fluffy. But if you leave the dough to rise too much is not good either, the dough will lose its power and sink during the baking process. So, leave it until about doubled in size. If using fresh yeast you will need ½ cube for making this plum streusel cake. ½ cube are 21 g/ 0.7 oz in Germany. Step 1: Give the flour, sugar and salt to a bowl. Mix well with a spoon. Step 2: Give the milk to a small pot and heat it very gently. It should only have about 36 degrees Celsius/ 96 degrees Fahrenheit, so body temperature. If it is hotter it will destroy the yeast and the dough will not rise. Step 3: Give the butter and the active dry yeast to the milk and stir until the butter has melted. Step 4: Give the milk mixture and the lightly beaten egg to the flour mixture. Step 5: Knead the dough with the hand-held mixer fitted with dough hooks. Knead as long as possible to combine everything well together. Step 6: Turn the mixture onto the working surface and knead the dough with your hands for a couple of minutes. Step 7: Form a ball, give it back to the bowl, cover the bowl with a clean cloth and let the dough rise in a warm place. The dough will need about an hour until about doubled in size. To make the streusel you could either mix the ingredients in the food processor until the mixture turns to crumbs. You can also make the streusel with your hands rubbing the cold butter into the flour mixture until you obtain the crumbs. However, if using your hands only rub the butter and the flour with your fingertips, the palms of your hands are too warm for this procedure. I always hold my fingers under cold water before doing this, I dry them well and then I start rubbing the butter into the flour. Place the bowl with the streusel in the refrigerator until ready to use. I always use Zwetschgen to make this Zwetschgenkuchen recipe. They are a smaller sort of plums, dark and sweet sour, also known as Italian plums or European plums, which grow just about every corner around here. I never ever had to buy them, I have several friends and neighbors who give me tones of them every autumn. And there are so many plums or Zwetschgen everywhere this year, just like cherries and blueberries in July and blackberries in September. I have spent about 20 minutes picking plums last week and I’ve had enough to bake two large cakes, make a plum dessert, cook 5 jars of plum apple barbecue sauce and can 10 huge jars of plums. Not to mention the kids have been eating lots of plums every day. I prefer to use Zwetschgen or Italian plums when making this easy plum cake because they are rather less juicy than regular large plums so the dough will not get soaked. They are also much easier to cut from the stone, giving you this beautiful butterflied plums to cover the cake with. They are less sweet than regular plums, a sweet sour taste, which develops even more during the baking process, making this German plum cake better than any plum cake you have ever had before. While the dough is rising, remove the stones from the plums. Don’t cut the plums all the way through, they should remain attached on one side. You will need more or less 1 kg/ 2.2 lbs plums, just keep going until you topped all of your dough. Line a large baking tray with baking paper. My tray is 30×40 cm/ 12×16 inches. Roll the yeast dough with a rolling pin to match the size of the tray. Carefully place the dough on the tray and stretch and press with your fingers until everything fits. Arrange the stoned plums on top of the easy plum cake. Sprinkle the streusel on top of the plums and bake the German plum cake in the preheated oven for 30-35 minutes or until the streusel are golden brown. Let the cake stand for about 20 minutes before slicing it. Yeast cakes are always best served on the day you bake them. However, leftovers are still delicious the next day, but not as fluffy and fresh anymore. You can serve the German plum cake as it is or sprinkle it with some icing sugar. Traditionally, you would whip some heavy cream and top the plum streusel cake with a generous dollop of it just before serving. You can serve the easy plum cake lukewarm as well. In this case, serving it with a dollop of slowly melting vanilla ice cream on top is just heaven. Give the flour, sugar and salt to a bowl. Mix well with a spoon. Give the milk to a small pot and heat it very gently. It should only have about 36 degrees Celsius/ 96 degrees Fahrenheit, so body temperature. If it is hotter it will destroy the yeast and the dough will not rise. Add the butter and the active dry yeast to the milk and stir until the butter has melted. Give the milk mixture and the lightly beaten egg to the flour mixture. Knead the dough with the hand-held mixer fitted with dough hooks. Knead as long as possible to combine everything well together. Turn the mixture onto the working surface and knead the dough with your hand for a couple of minutes. Form a ball, give it back to the bowl, cover the bowl with a clean cloth and let the dough rise in a warm place. The dough will need about an hour until about doubled in size. Give the flour, sugar and cinnamon to the food processor. Pulse shortly to mix. Add the very cold butter, cut into cubes, and process shortly until the streusel form. Place in the refrigerator until needed. If you want to make the streusel without the food processor, mix the flour, cinnamon and sugar in a bowl, give the cold butter cubes on top and rub the butter into the flour until you obtain the streusel. Only use your fingertips, if you use your palms of your hands the butter will get warm too quickly. Remove the stones from the plums while the yeast dough is rising. Don't cut the plums all the way through, they should remain attached on one side. Line a large baking tray of about 30x40 cm/ 12x16 inches with baking paper. Roll the yeast dough with a rolling pin to match the size of the tray. Carefully place the dough on the tray and stretch and press with your fingers until everything fits. Arrange the stoned plums on top. Sprinkle the streusel on top of the plums and bake the cake in the preheated oven for 30-35 minutes or until the streusel are golden brown. Let the cake stand for about 20 minutes before slicing it and serve as suggested above. Note: If using fresh yeast you will need 21 g/ 0.7 oz of it. The dough will probably rise quicker in this case, so check after 30-40 minutes already and proceed with the recipe if the dough has doubled in size. This cake looks so great. I find it interesting that the bottom layer is a yeast dough. This is a different way of making a cake. I’ll need to give it a try. i’m fascinated by the yeasted dough base–what a great added flavor and texture in contrast to a regular ol’ shortbread! Adina, what a gorgeous cake! Your directions make this seem like such an easy approach, too. I would love to make this soon!